Amanda Cockburn teaches English literature at Dawson College in Montreal. The soldier is a beardless young man—a child with hardly the muscle to swing a stick. The general gives him a brief pep talk while smearing war paint on his face. Too soon, in a scrum of screaming soldiers covered in mud and gore, he witnesses the boy’s throat being cut. The general then locks his gaze with three women, watching on in the distance. The general is Macbeth and the three women are the Weird Sisters. What is immediately obvious in Justin Kurzel’s adaptation of Shakespeare’s most unsettling play is the vanishing act of large chunks of the original text. The chilling seesaw rhymes and awful incantations of the Weird Sisters, which Shakespeare used to create the wild and unearthly tone of his play, have been tossed into a boiling cauldron somewhere off set. Instead, the playwright’s creepy witches are reduced to three figures on the misty sidelines of the battlefield dressed as earthy peasants, their powers subdued to an unthreatening Druid mysticism. They prophesy Macbeth’s future as king in voices so soft and honeyed they sound more like cooing babysitters than pot-stirring embodiments of evil. But I get it. Macbeth, played by Michael Fassbender, is traumatized by the barbarity of medieval life. He has reached his breaking point. And the soothsaying witches are merely witnesses to the violence that sets Macbeth’s mind unravelling. There is no room in this adaptation for an engagement with the metaphysical problem of evil. The only evil is war and its damaging effects on the human psyche. In other words, our Macbeth suffers from PTSD. Anachronistic readings can reveal new perspectives in the production of a play. Part of what I love about Shakespeare is how the richness of his works resonates across time, culture, and different social contexts. But sometimes such readings offer a false understanding of a great work. Shakespeare’s tragic hero is a brave and valiant highland warrior devoted in his service to King Duncan until a fateful encounter with a group of black magic hags reveals he will be king and triggers a darker ambition. His seemingly tough-as-nails wife, whose mind immediately leaps to thoughts of assassination when she hears news of the witches’ predictions, further stokes this desire. Though she talks up a pretty good game, Lady Macbeth is actually a bit of a blowhard: she can’t finally do the deed because King Duncan looks too much like her dad when he’s sleeping, and then of course she loses her mind from the guilt of all the bloodshed. As for Macbeth, he inevitably transmogrifies into a nihilistic, ruthless goon, a murderous monster who loses all trace of his humanity the deeper he wades into a bloody mess of his own making. In the play, as audiences witness the waning of Macbeth’s morality, we never see him entirely lose his grasp of reason, a quality Shakespeare demonstrates through Macbeth’s facility of language. When Hamlet feigns insanity, he talks nonsense. When Othello falls into a rage of jealousy, he suffers seizures and is incoherent. But when Macbeth kills Duncan and describes the murder scene as though he hadn’t been there, his use of metaphor is controlled, albeit a bit forced: “—Here lay Duncan, / His silvery skin laced with his golden blood, / And his gash’d stabs look’d like a breach in nature, / For ruin’s wasteful entrance; there the murtherers / Steep’d in colours of their trade, their daggers / Unmannerly breech’d with gore.” These are the words of a careful hypocrite, not of a wounded mind. Despite Macbeth’s horrifying choices, Shakespeare creates a character who never loses his capacity to think clearly. 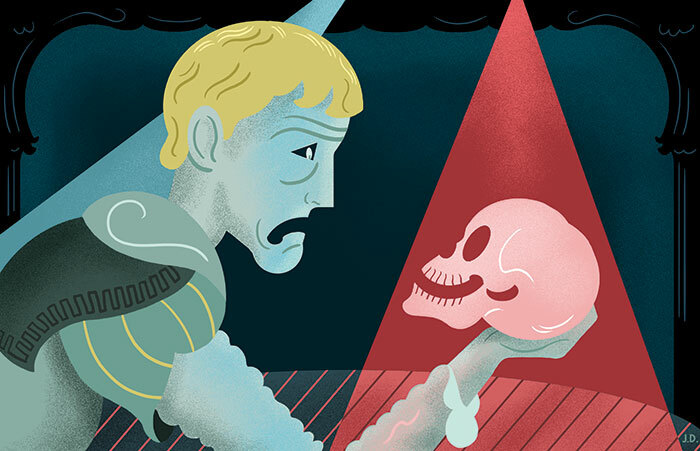 Sure, Macbeth becomes a tyrant, but he never really goes mad—that’s his wife’s business. This is what makes the play morally and philosophically interesting. Macbeth knows what he does is wrong, but he does it anyway. And he keeps doing it until Macduff cuts off his head. Socrates’s conclusion would be an apt ad copy for Kurzel’s Macbeth. The idea that this fearsome warrior is suffering from PTSD only serves to pathologize his actions, thereby alleviating him of moral agency in choosing to kill the man he serves, along with all the other characters who meet their end by his hand. In Shakespeare’s play, what’s interesting is beholding a man “too full o’ th’ milk of human kindness” turn bad as we witness the character convince himself that an evil deed is the right course of action. It’s the same principle that made Breaking Bad so good. Audiences watch Macbeth’s character change fundamentally, and it is this transformation that is the heart of the drama. But this isn’t so in Kurzel’s film. This Macbeth, spurred by a wife (played powerfully by Marion Cotillard) embittered by the loss of their child and his own trauma, acts so maniacally in his first murder and throughout the film that there’s no stake in watching a good guy lose himself. That already happened in combat. When he kills Duncan, there’s no real moral struggle. Instead, Macbeth suffers flashbacks to blood-soaked battlefields that prime him for slaughter, and a vision of the fallen young soldier actually hands him the dagger to do the deed. As Macbeth stabs the king with furious abandon, it’s as though he’s avenging the dead boy, so that the regicide doesn’t read as the ruthless act of an ambitious man but an indictment against an authority who would send children into war. In the world of the play, though, the lines and dramatic devices that Kurzel decides to include emphasize Macbeth’s guilty conscience, the sense that he feels he is doing wrong even as he rationally justifies his own actions. To suggest Macbeth actually suffered PTSD by cherry picking lines and dramatic moments is to isolate them from their meaning within the context of the plot. It also means ignoring all the other visions and spectres in Shakespeare’s oeuvre, such as when Brutus witnesses Caesar’s ghost or when Hamlet is visited by his father’s spirit (twice). Ghosts in Shakespearean drama typically signify a guilty conscience or the chaos born from the political upheaval of regicide. And there’s the rub. Regicide as a fundamental disruption to the social order simply isn’t as relevant to contemporary audiences as it was in Shakespeare’s day, and neither is there much room for valour and glory to soldiering in the public imagination. How do we even consider Macbeth without discarding our existent general knowledge of war, including how it scars the minds of soldiers? And why should a showbiz man like Kurzel overlook an opportunity to adapt this play when films about PTSD (The Hurt Locker, American Sniper, to name a few) have recently attracted so much critical attention and money in the movie industry? I can’t imagine there were heated debates about the integrity of authorial intention, new historicism, or reader response theory when this movie was pitched—that’s the stuff of graduate school classrooms and literary forums, not the mechanisms of cultural production. And this isn’t Stratford or Shakespeare in the Park, either: Kurzel’s adaptation relies on the visual power of its medium more than it depends upon Shakespeare’s language. With Adam Arkapaw’s gorgeous cinematography (True Detective), coupled with the mournful, moaning cello of the musical score, it’s damn near sublime. And fixed his head upon the battlements. That’s both badass and scary as hell. Glamorous it is not. It’s this brutality of war that Kurzel is tapping into in his adaptation of Shakespeare’s play—in fact this is the first long passage we hear spoken in the movie. Kurzel’s film may fall short in eliciting moral enquiry, but it might also draw more attention to the consequences of war and violence for those fighting today.